Performance-minded people everywhere trust OPTIMA batteries because they know that OPTIMA keeps performing at peak power long after other batteries have failed. Find someone who is serious about performance, and chances are you will find an OPTIMA battery under their hood. Fleet users, from hardworking aircraft ground support crews to police departments and ambulance companies, depend on OPTIMA to get the job done when lives are at risk. When livelihoods are at stake, you’ll find OPTIMA hard at work on the farm and in construction equipment, as well as in all types of commercial applications. OPTIMA batteries are even called upon when justice and liberty are on the line — OPTIMA batteries are approved by the U.S. Military and other branches of the government. OPTIMA batteries deliver power in extreme situations; but it doesn’t have to be a matter of life or death to choose OPTIMA. It could be a simple matter of dependability. OPTIMA has become the power source of choice for race professionals, off road enthusiasts, car stereo installers, and vintage/classic car collectors. Also, average drivers, who depend on their vehicle and need to get the most value, performance, and “peace of mind” out of their family car, recognize the many benefits of utilizing the OPTIMA and they are increasingly switching over from conventional batteries. Thanks to SPIRALCELL Technology, OPTIMA’s batteries deliver more power from a compact size, and will reliably deliver that power after years of use. The SPIRALCELL configuration of the plates and their close placement to each other allow for superior resistance to the biggest battery killers: vibration and shock which causes their flat plates to shed the active paste material on the plates. Once this material sheds, the battery becomes damaged, loses capacity, and no amount of recharging or additional electrolyte can revive it. Looking at OPTIMA’s SPIRALCELL Technology, the reason for OPTIMA’s legendary vibration resistance becomes apparent. Tightly wound and compressed into a cylinder, the plates in an OPTIMA battery simply cannot move, break, or shed their active material. This advanced design allows OPTIMA batteries to last considerably longer than conventional batteries. Independent Society of Automotive Engineers (SAE) tests prove that an OPTIMA battery can still perform after 12,000 cycles (starts). In those same tests, the life span of conventional batteries averaged only 4,000 cycles. Even when new, an ordinary battery can never match the performance of a comparable OPTIMA battery. Why spend the time and money buying several conventional batteries when a single OPTIMA battery will serve you faithfully and trouble-free for years? Damage from vibration is one of the leading causes of battery failure. OPTIMA’s patented Spiralcell Technology® immobilises the internal components, providing up to 15 times greater vibration resistance than traditional batteries. Designed to withstand significantly more discharge and recharge cycles, OPTIMA batteries continue to deliver a high percentage of the original fully charged capacity. The first 10 seconds of a vehicle’s starting cycle are critical. OPTIMA batteries deliver a comparatively higher level of power during this cycle, than traditional batteries. 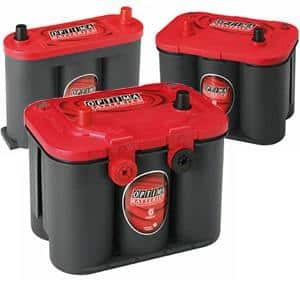 While traditional batteries will leak acid at just 45o rotation, OPTIMA batteries can be rotated up to 180o with no spillage. 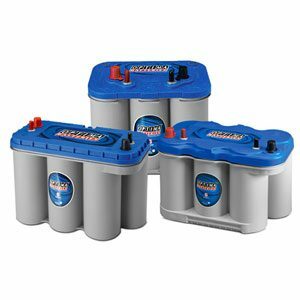 There is no need to perform routine maintenance; OPTIMA batteries are completely sealed and non-hazardous. Heat damage is a leading cause of battery failure, particularly in performance vehicles. OPTIMA batteries can outlast traditional batteries by up to twice as long, even when exposed to high temperature conditions. *The battery should be fully charged before being disconnected for extended periods of non-use.